That's why flushing the cooling system and pH balancing the coolant is recommended at least once every two years. Our coolant system power flush removes contaminates. We pressure test the cooling system for leaks, clean the recovery bottle and pressure test the radiator cap. The system is then refilled with the proper mix of coolant and water to reach the -35 degrees for winter protection. Be Careful Removing The Radiator Cap! The radiator’s heat and pressure build up to dangerous levels when a car is running. Serious injury can come from removing the cap from a hot engine. If too much pressure has built up, removing the cap can send boiling water and steam up and out in all directions. Allowing the car to sit for around 30 minutes will ensure the pressure and temperature has dropped to a safe level before you attempt to remove the radiator cap. Most caps have a clear warning label on the outside of the cap itself warning about this important step. Coolant over heating engine Finally, your coolant needs to be fresh. Over time and miles, the anti-corrosion additives in the coolant are depleted and the coolant can actually start to eat away at the cooling system parts. Your owner’s manual and our service adviser can help you with the recommended coolant replacement schedule and make sure you’re getting the right type of coolant. We see leaky water pumps and hoses in our area that need to be replaced, too. There’s also a part called the thermostat that opens and closes to regulate the flow of coolant. Sometimes they stick open or closed and the cooling system won’t work properly. Last week I was out running errands in St. Charles and my temperature warning light came on – total panic! I pulled over and my car was overheating. After it cooled down, I went right into my St. Charles service center to have them take a look. My service advisor at Sparks Tire & Auto told me my water pump was leaking and needed to be replaced. He said water pumps just wear out and that you need to replace them because they pump the coolant that cools the engine. He told me they checked out my radiator hoses, serpentine belt and tensioner and that they were OK. But I was overdue for changing my coolant – like, embarrassingly overdue. I didn't realize there was a schedule in my owner's manual for when to change my coolant. My Sparks Tire & Auto service professional said that the coolant actually becomes corrosive over time and could damage my radiator, head gaskets, intake manifold gaskets, heater core, metal cooling pipes, expansion (frost) plugs, etc. That's why Sparks Tire & Auto recommends changing the fluid on schedule. So, Sparks Tire & Auto replaced the coolant with the kind my owner's manual recommends. I learned there are different kinds of coolant and you need to use the right one. I was on my way. It feels good knowing my cooling system is healthy and I don't need to worry about it. Engines get hot when they run. This heat can build up and damage vital engine parts, so engines need a cooling system to keep them running. Cooling system failure is the most common mechanical failure in vehicles. This is unfortunate, because these failures are usually easy for St. Louis drivers to prevent. Insufficient coolant can lead to engine failure. Coolant levels need to be checked regularly and topped off as necessary. If coolant levels drop quickly or consistently, the cooling system should be inspected for leaks. Coolant/antifreeze contains additives that protect the radiator and other coolant components from rust, scale and corrosion. Over time, these additives are depleted, so it is necessary for St. Louis drivers to replace coolant at specified intervals. 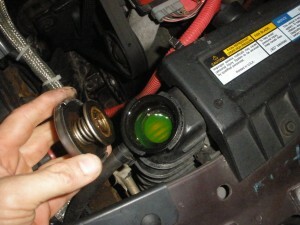 Changing coolant should be part of routine preventive maintenance for any vehicle. This service is often ignored, though, since old coolant still cools the engine. Vehicle owners don’t realize there is a problem until the system fails. They are left with major repairs and possibly a damaged engine, which could have been prevented with a cooling system service at Sparks Tire & Auto in St. Charles Missouri. If your sedan sends a warning message to check its coolant or if the temperature gauge is reading in the red or hot zone, then the cooling system needs an automotive analysis. This service is critical and should not be put off since the potential for damage is high. Topping off in an emergency, however, does not fix the problem. The vehicle should immediately be taken to Sparks Tire & Auto where they can inspect the cooling system, repair any leaks, and clean it if necessary. They can identify what caused the emergency situation in the first place and ensure it doesn’t happen again. Regular maintenance of a vehicle’s cooling system is just good auto advice for St. Louis drivers. Cooling system service is relatively inexpensive and doesn’t take long at Sparks Tire & Auto. Lack of it, however, can put a vehicle in the scrap heap.